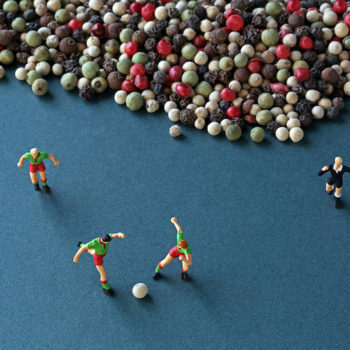 Marrying inspired photographs of real food with tiny people, Christopher Boffoli stages arrangements to create clever photographic vignettes. Boffoli’s palette includes hand-painted German miniatures, artisan confections, fresh fruit, crisp vegetables and northwest crustaceans. His Lilliputian characters interact in everyday scenarios creating quirky, often darkly humorous storylines. Boffoli’s unique lens captures tongue-in-cheek moments of happiness, hope, adventure, pride, greed, menace, and solitude of little people in a mammoth world. Inspired by an unusual combination of magazine food photography and the 18th century fable “Gulliver’s Travels,” Boffoli’s fascination with the reoccurring cultural appeal of shrinking people in giant worlds is found throughout popular culture in both literature and cinema. What makes Boffoli’s photography so engaging is the approach towards mundane daily tasks and the humorous caption that informs each piece. For the tiny men hoisting the American flag in “Iwo Cupcake,” Boffoli adds, “No piece of territory is too small or strategically insignificant to claim for your country.” Nominated for the James Beard Award in 2012, Boffoli’s Big Appetites series has been featured in The Washington Post, National Public Radio, The Chew, The Huffington Post, Oprah.com, and in other media outlets internationally. His work has been exhibited in the United States, Canada, and Europe. Boffoli’s newly launched first book, Big Appetites: Tiny People in a World of Big Food (Workman Publishing) is available through Winston Wachter Fine Art.